This easy-to-clean laminated cotton canvas wallet is perfect for every day use. Durable construction ensures that it will last for years. 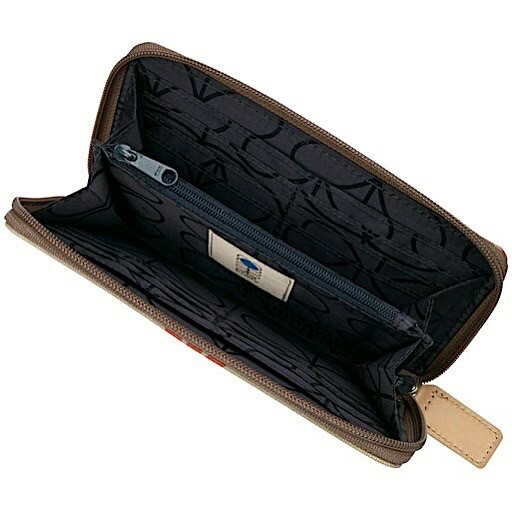 The interior includes a zippered change pocket, with card slots and bill holders on each side. The zipper closure makes for easy access to everything you need. Stay practical and stylish in Orla Kiely's signature bold patterns! 100% laminated cotton exterior. Leather details. Nylon lining. This product is made from high quality laminated fabric. Due to the nature of this material please take care when wearing dark clothing or denim as color may be transferred!